The past few days have been warm and sunny, and we have even eaten dinner out on the back porch twice! This beautiful weather, combined with reading about Urban Vegan's trip to Mexico, made tacos the logical choice for tonight (well, if sun+warm=tacos makes logical sense to you). I did not have any salsa or any sour cream, so I wanted to make a flavourful taco that did not rely on these ingredients. I'm not sure that rice is a traditional taco ingredient, but it works here. The tofu portion of the dish is a no (added) fat version of the tequila chili lime tofu I made a while back. The rest of the toppings are up to you, but the ones I used here worked really well. The avocado brings creaminess, the mesclun brings earthiness, and the hot sauce gives some bite. 1. Rinse rice and place in a pot with water, chili powder, paprika, oregano, salt, and cayenne. Bring to a boil, stirring to keep rice from sticking to the bottom of the pot. Reduce heat, cover, and simmer for 15-20 mins, until rice is cooked. 2. While rice is cooking, make the tofu. This method only works if you have a good non-stick pan. Heat pan over medium heat and add in tofu cubes. Cook for about 15 mins, flipping the tofu often, until all sides are golden and tofu has released its water. This makes for a nice chewy texture. 3. Add tequila to the pan and cook until all tequila is cooked off/absorbed into tofu. Add juices and do the same thing. Remove from pan and serve. 4. 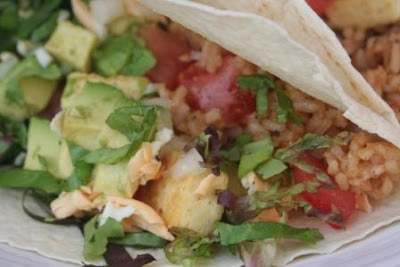 Assemble tacos: start with rice in a tortilla, top with tofu, then all the other stuff. Finish off with a few dashes of hot sauce and enjoy!